Life as a restaurateur was easier before the clientele expected entertainment while they ate. Celebrity endorsements and star performers are now what separate the fine dining experiences written about in newspapers from those being featured on the latest Guy Fieri vehicle. But there are only so many of each resource to go around, and you’ve only got so much budget to work with. Can you prioritize what will drive in the most lucrative customers while leaving your rivals with the scraps? 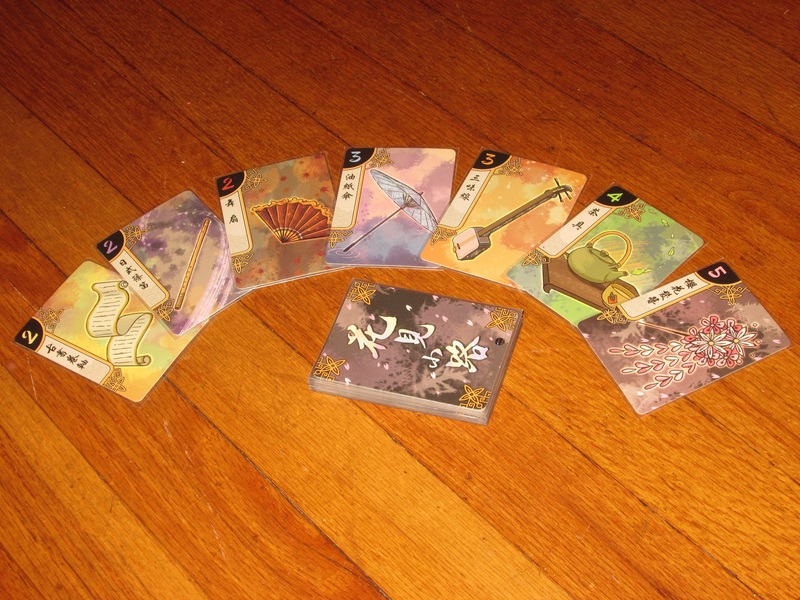 Hanamikoji is a two-player hand-management/area-majority game for two players. Players are restaurant owners trying to attract the favor of the geisha masters. 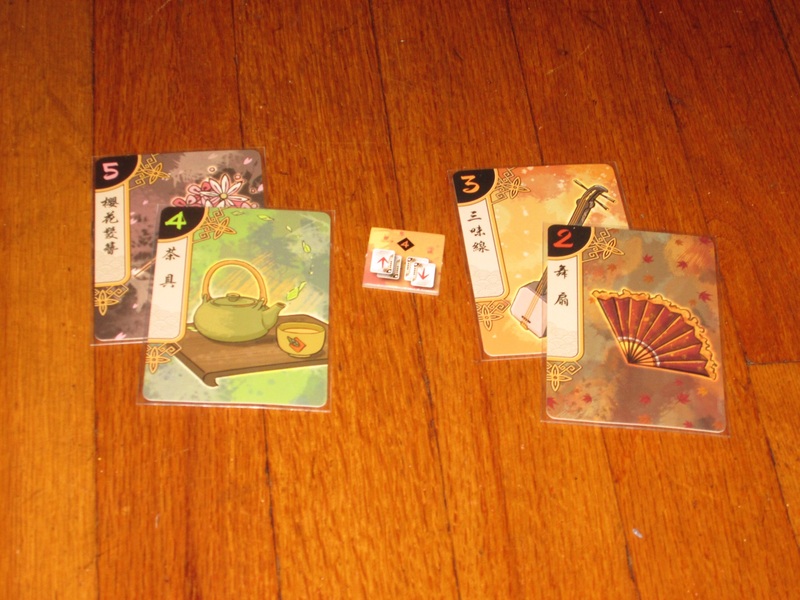 The player who wins the favor of four geisha (or geisha with a total charm of 11) at the end of a round wins. Hanamikoji set up for two players. To begin, the seven geisha are lined up in the center of the table from lowest to highest. Each player is dealt six cards, and one random card is set aside without looking at it. Play begins. Set aside one card face-down to be added to your side at scoring. Set aside two cards face-down to be removed from the game at scoring. Offer three cards to your opponent: your opponent chooses one and places it on his or her side of the table; you place the other two on your side of the table. Offer four cards to your opponent in two two-card lots. Your opponent places one lot on his or her side of the table; you place the remaining lot on yours. Geisha vary in “charm” from 2-5, and the number on the geisha represents the corresponding number of that geisha’s cards that are in the player deck. 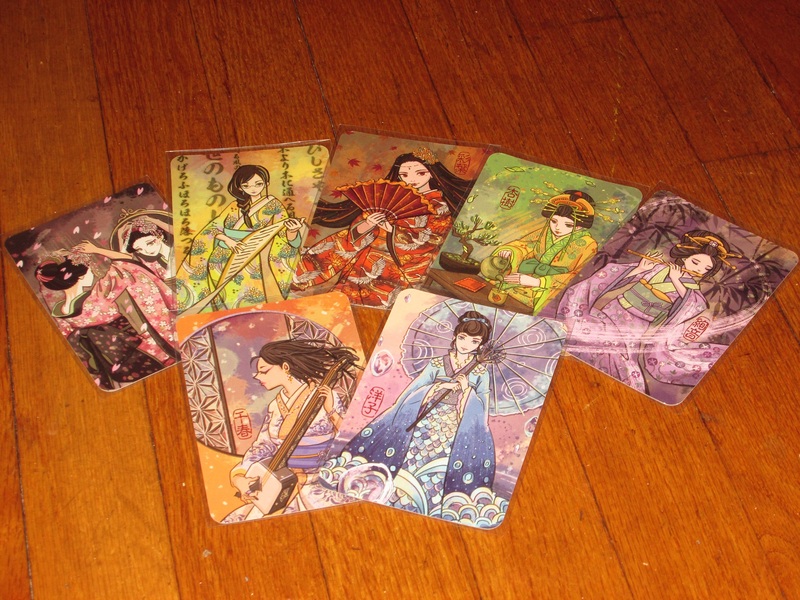 When players play cards, they play them to the matching geisha. Each player has reminder tokens to help them remember that they can take each action only once. Once each player has performed all four actions, the game is scored. If there are more cards on one side than the other, the favor token moves to the side with more cards. If there are equal cards on each side, the favor token remains where it is. 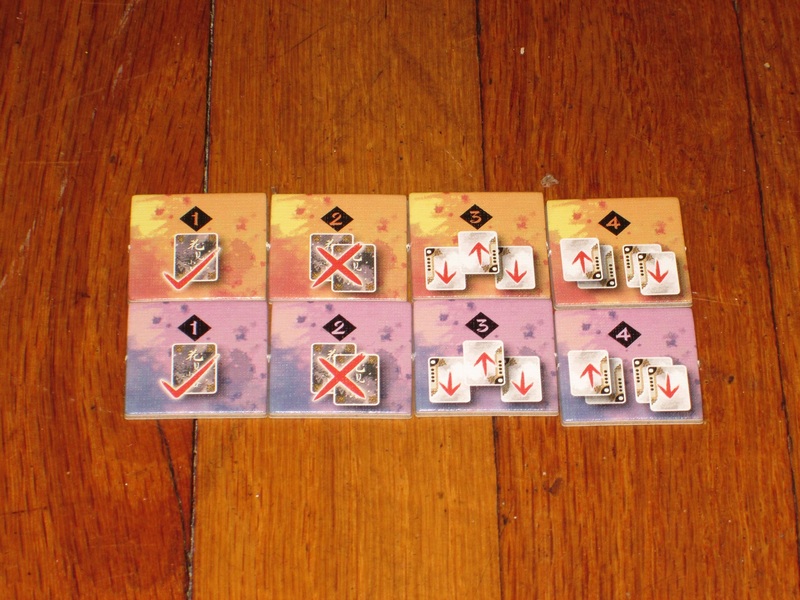 If there are four favor tokens on one player’s side or if one player’s favor tokens are for geisha whose total charm equals 11 or more, that player wins. If one player has four tokens and the other has 11 charm, the 11-charm player wins. If neither player has won, the players leave the favor tokens where they are and play another round. Two-player-only games are often a tough sell with me. Most opportunities I have for two-person play are with my wife, and while she is willing to learn new games on occasion, she has a strong bias for games she already knows because then she doesn’t have to learn the rules. So a game has to be particularly good in order to make her want to play it. 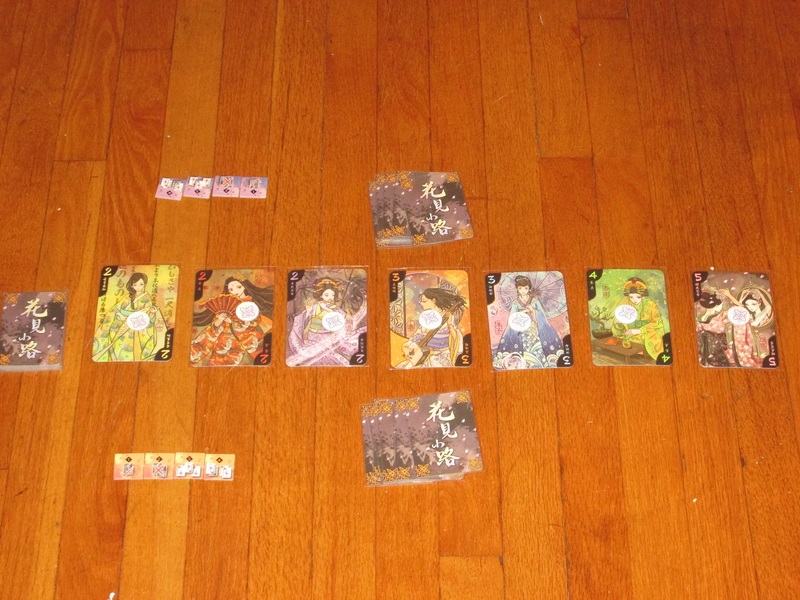 So let me start off this review by saying that Hanamikoji is an excellent two-player game. The geisha whose charm you’re trying to attract to your restaurant. The cards are double sided. One side shows just art; the other side has a reminder how many of each card are in the deck. My wife says simple games are her favorite, but she likes “smart simple” games, not “stupid simple.” (Stupid simple examples she gave are Candy Land and Kingdom Builder–don’t shoot the messenger!) Hanamikoji is definitely a simple game: it doesn’t take much time to explain the rules, and it’s easy to grasp them once explained. Yet the simple rules make room for lots of tense decisions, which places it in the “smart simple” category. What makes Hanamikoji so tense is that you have to make decisions based on limited information. You start the game with knowledge of six cards, and one card gets added to your hand each turn. In total, you will control ten cards over the course of the game–just under half the deck. Your opponent will end up showing you seven cards over the course of the game. You might think, Seventeen out of twenty-one cards. That’s not too bad. But information in Hanamikoji is at a premium, and while you’ll know where twenty-one cards are going by the end of the game, on turn one you have knowledge of only what’s in your hand, and knowledge only slowly unfolds at the pace your opponent dictates. 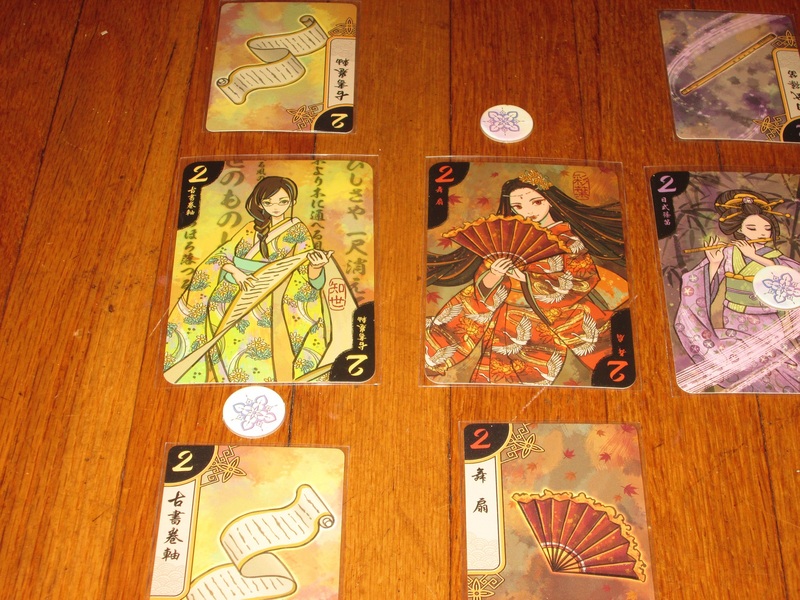 There are only 21 item cards in the deck, each corresponding to a different geisha. You’ll choose what to do with ten of these over the course of the game. Further tightening the game is that of the ten cards you will see, you have to do something with each one, and you have to decide before having full information. You have to assign it either as a guaranteed keep or a guaranteed scrap…or you have to offer it to your opponent. And this is the tensest thing of all. I’ve heard it said that you never offer someone a deal unless you know what they’ll say in advance, but in Hanamikoji, I feel like I’m constantly surprised. The reason is that while I have knowledge of what I’ve seen, I don’t know what cards my opponent has played face-down or what cards are in his or her hand. So I’m offering a deal without having all the facts. What I think is a clear choice in one direction might be altered by information I don’t have. This is fascinating. It’s fascinating that, of the ten cards you control, three of them will be going to your opponent. This may not seem like much at first, but as the game goes on, the decision of what cards to offer your opponent gets weightier and weightier while your options of what to keep from them dwindle. The key thing here is that there isn’t a “best” card or a “best” strategy. Winning lots of the less charming geisha can earn you the game if you get four, but it can also be a risky strategy if in earning their favor you allow your opponent to win the most charming ones. Total charm beats broad winnings, so players have to weigh their options carefully. The gameplay gets more tense as it goes along because each round has four turns, and a player must perform each action. It can be tempting to stave off any action until the last one, but because you draw a new card before each turn, you never know what you’ll be doing in the last round. Do you save your 1-card save until the last round? The card you draw might be useless to you. Do you save your 2-card throwaway? You might discard just what you need. Do you save your 3-card offer? Your opponent gets first choice, and you might hand them the very thing they need to them on a platter. Do you save your 4-card offer? There might be no way to pair good cards with bad, leaving your opponent with a clear path to victory. Of course, you must choose one of these options to be last, but each round it feels a little like pick your poison. I like that there are two kinds of offering, and you have to do both in a single round. In one method, you offer three cards, and while you get to keep two cards, your opponent gets to choose one card first, meaning your opponent will choose the best card. The tricky thing here is to either disguise your intentions or rig the choice so your opponent doesn’t benefit too much from the choice. In some games I’ve seen a player offer all three of one kind of 3s to the opponent, and this can be a good move–but the trick is not to waste this offering. Each mode of apportioning cards is important, and you don’t want to throw away a single opportunity. 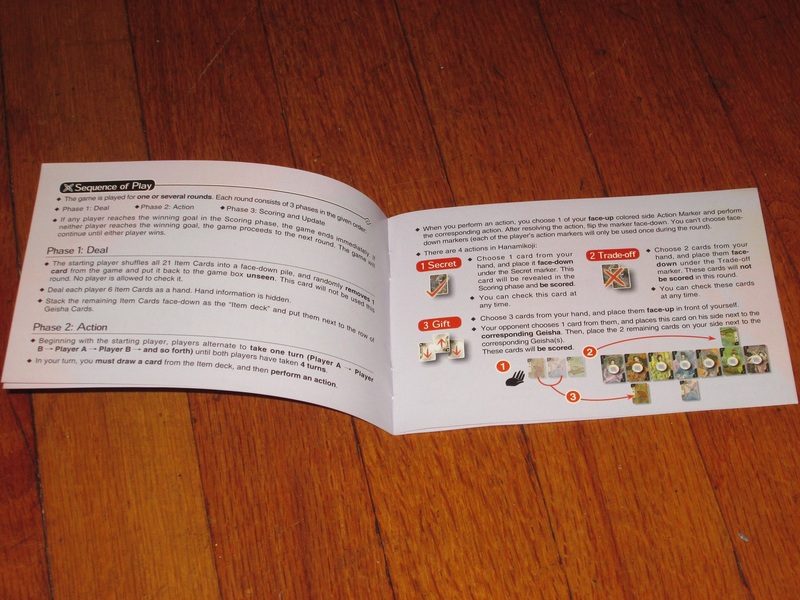 The game comes with several rulebooks in different languages, but the rules are short, simple, and easy to understand. Making game choices? That’s another story. Then there’s dividing four cards into two two-card lots. This always feels like the tensest part of the game, but I know I’ve done a good job when my opponent has to sit and consider for a bit which lot is better. And it’s this kind of cleverness that makes Hanamikoji so addictive and rewarding: you are constantly trying to set subtle traps for your opponent while also dodging the subtle traps your opponent has set for you. But for all its subtlety and tension, the game doesn’t devolve into brain burn and despair. Because there are so few cards in the deck and you have so few cards to work with, there is, somewhere in the back of your mind, less angst over mistakes. The information control simultaneously ratchets up the tension (“What’s going to happen? !”) and provides some release from choosing the optimal move. There’s simply no way to know. Yet player choices still matter a great deal. Favor tokens stay in place from round to round, so if you win a geisha’s favor one round and merely tie the next, you retain the token. I like that the game is played potentially over several rounds until one player either collects four favor tokens or 11 charm. I’ve had games last as short as one round and as many as four. The idea that the favor tokens stay where they are in the case of a tie is brilliant. It means that the game doesn’t reset at the end of each round–the geisha “remember” the better restaurant. There’s still the possibility for a comeback, but the player who capitalized on earlier opportunities will have an advantage. I suppose it’s theoretically possible for the game to go on for a long time (and the rules provide for an optional three-round variant if this is the norm), but even here, it’s rewarding to see the back and forth that takes place as players grapple for supremacy. The question that will inevitably be asked about Hanamikoji is where does it fit? There are lots of great two-player-only games already; does Hanamikoji hold its own against classics like Lost Cities and Battle Line/Schotten-Totten? Is it worth getting if you have some of the other staples? I would say Hanamikoji feels most like Schotten-Totten–not necessarily mechanically but because it’s a back-and-forth, tug-of-war struggle. For me, Hanamikoji compares quite well to this classic. In fact, I prefer it to Schotten-Totten, even though I like the earlier game quite a bit. Part of this, I’m sure, comes down to the fact that I’m terrible at Schotten-Totten. For whatever reason, I’m not good at the kind of sacrificial thinking necessary to be good at it, whereas I have an easier time grasping the give-and-take decisions of Hanamikoji. I am also a huge fan of the “I split, you choose” mechanism and wish it were employed in more games. Hanamikoji also has the risk-before-you-know-much tension of Lost Cities, which to me is all for the good. In both of these comparisons, Hanamikoji doesn’t fire the older games. 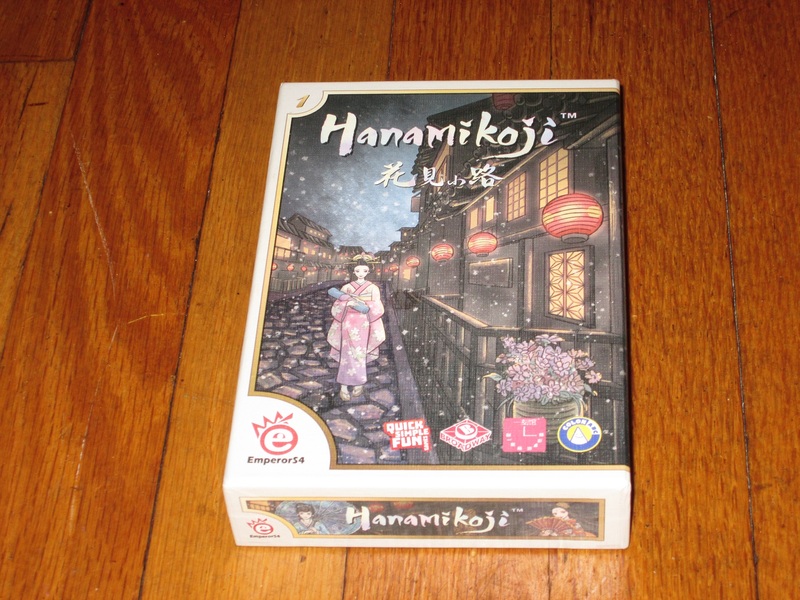 To me, it feels new and fresh and covers different ground from other games, so just as I made room for recent hits like 7 Wonders Duel and Patchwork before it, Hanamikoji has similarly earned its place in my collection. The game doesn’t have many components, so this is a compact game. The components in Hanamikoji are excellent. 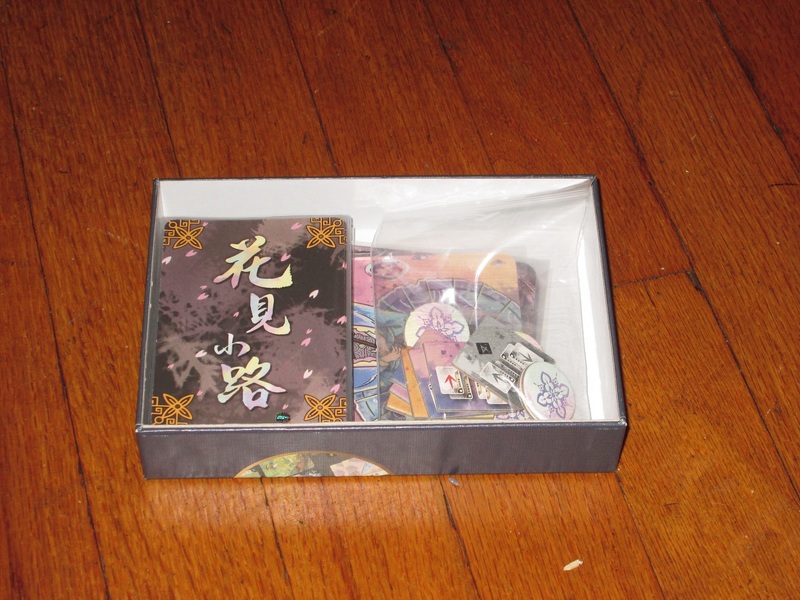 I love that the geisha cards are (unnecessarily) large format (e.g., Dixit/Mysterium). The artwork on all of the cards is stunning, and the cards have a good linen finish. My cards arrived slightly warped, but after bending them back and forth several times, they are mostly back to normal. I like that the game includes cardboard tokens, and these are well done too. All told, Hanamikoji is an attractive package, and while the price point is a little higher than a typical two-player card-only game, I think this is justified in the gameplay and the components. This game looks great when it’s out on the table–so good that it attracts the attention of passersby–and it’s an enjoyable game that I want to play over and over. Writing about Hanamikoji has made me want to play Hanamikoji, which is perhaps the highest praise I can give it. I mentioned at the start of the review that two-player-only games usually have to pass the wife test or they go in the trade pile. Beyond passing the wife test, Hanamikoji has passed the friend test as well. I’ve played with several different friends, and each has given it their seal of approval. Between its gorgeous look and even more attractive gameplay, I think Hanamikoji deserves to join the ranks of the classics. It has certainly elbowed its way onto my already crowded shelves. 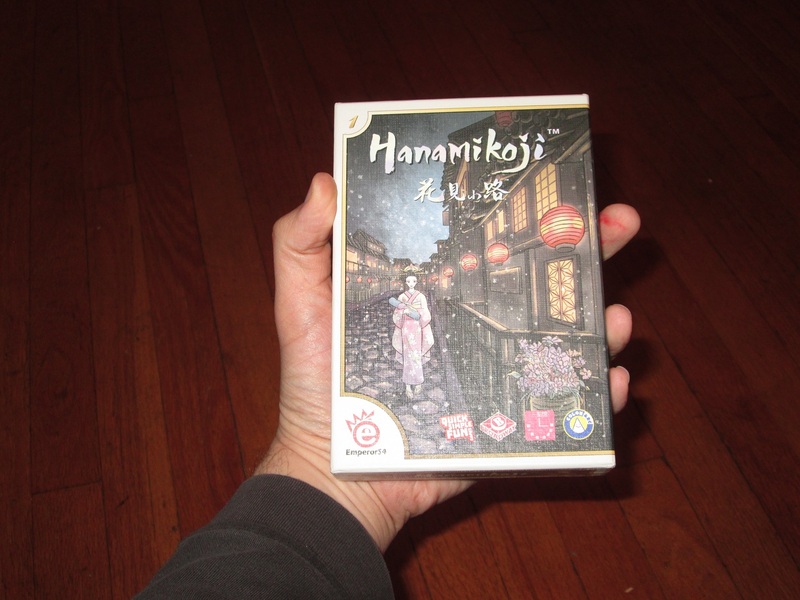 iSlaytheDragon would like to thank QSF Games for providing us with a copy of Hanamikoji for review. And another excellent review for this little gem.